Instructor User Guide ResourcesHow do I navigate the Resources tool? 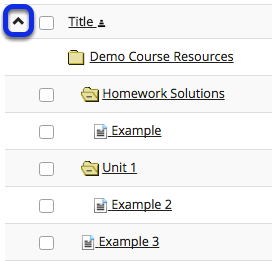 Clicking the tool name in the site-level breadcrumb trail will always return the Resources display to the root level with all the folders closed. 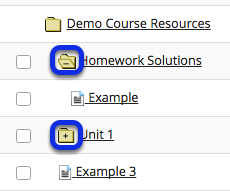 Folders with content will display a Plus +. Clicking Plus + will open a folder, within the view of all of the folders. Clicking Minus - will close a folder. Clicking All Site Files button will display a search field. 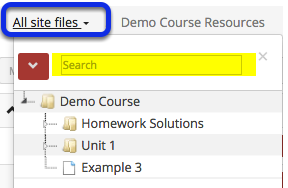 Enter keywords to locate a specific file or files.